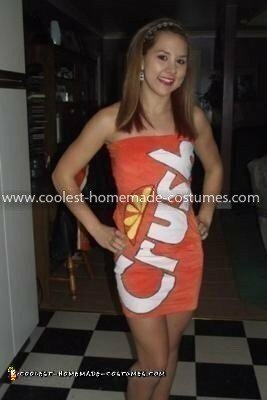 I decided to be an orange crush pop can. The orange fabric is stretchy, it was originally white, me and my mom dyed the color with a fabric dye (used red) as it faded, we then stitched the fabric as a tube top dress. The ‘Crush’ logo, was sketched out using a pillow case, the green print around the letter is green permanent marker (do before you cut letters out) then the orange slice, I used a piece from the orange fabric used as the dress for the outline of the slice, then cut ‘rain drop’ like shapes out of a yellow towel. 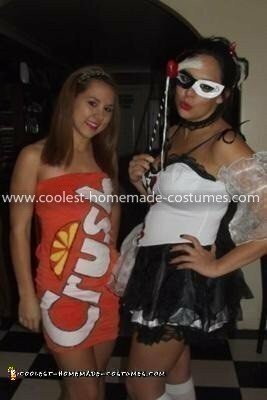 This Orange Crush Pop Can Costume was a HUGE attraction, everyone liked it, I complemented it with pop tab earrings along with pop tab headband. As for shoes I had simple light green heels to complement the green in the letters, along with pop tabs on the shoes! 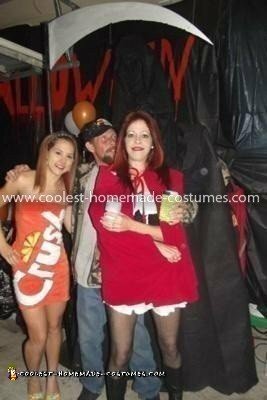 Verry easy costume! Then with the time I had left, I hot glued everything onto the dress, it all stayed perfectly, it has been for about 4 outgoing parties, and it still looks great!